Click here to registerOctober 27, 2013 from 3:00 – 6:00 p.m. In September, former White House Chef and Lancaster native Chef John Moeller is releasing his new book, Dining at the White House—From the President’s Table to Yours. 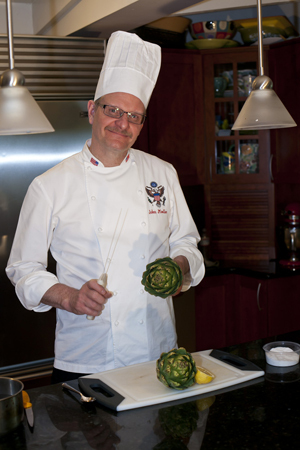 Chef Moeller is a noted fundraiser who has raised tens of thousands of dollars for various local and Washington, D.C. charities over the past few years. Continuing this tradition, John is dedicating one of the major launch events for his new book as an opportunity to raise funds for the Hempfield Area Food Pantry. The Hempfield Area Food Pantry, Inc. is a nonprofit ministry housed in Zion Evangelical Lutheran Church in Landisville, Pennsylvania. The pantry is dedicated to serving those in need of supplemental food who live in the Hempfield School District. It is a nonprofit partnership of many churches and civic organizations in the community. The pantry is solely funded by donations and grants and is completely led and run by volunteers. It is a partner agency of the Central Pennsylvania Food Bank. Chef Moeller is partnering with the Hempfield Rotary Club, the Hempfield Area Food Pantry, Brubaker Inc., and LifeReloaded Specialty Publishing to deliver this exciting event. Lori Burkholder from WGAL will be the emcee for the event. The Harvest Celebration is being held under a tent at Brubaker Inc., 1284 Rohrerstown Rd., Lancaster, PA on Sunday, October 27, from 3:00–6:00 p.m. (tentative timing). Tickets are $85.00 per head. 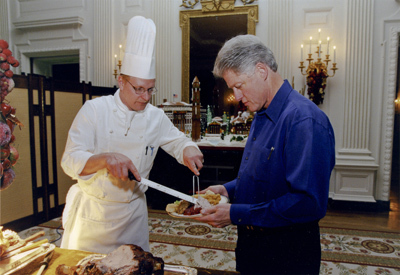 Your ticket includes a signed copy of Chef Moeller’s new book, Dining at the White House—From the President’s Table to Yours. The book includes over 100 recipes that Chef Moeller personally created and served to dignitaries such as Tony Blair, Vladimir Putin and Sophia Loren. Attendance is limited to 400, so ORDER TICKETS NOW to avoid disappointment. Your order will be confirmed by email. This is your ticket—you must bring your confirmation email to the event. You can still help the Food Pantry. Purchase Dining at the White House here with code DWHFP and 20% of the purchase price will be donated to the Hempfield Area Food Pantry.Note: this special offer closes on Thanksgiving Day — Thursday, November 28.